For making Tzatziki: Place yogurt in a bowl and set aside. Combine cucumber, garlic and dill in a food processor or blender – pulse until combined and finely chopped. Strain contents in a coffee filter and squeeze gently to release excess water. Stir cucumber-dill mixture into yogurt, adding lemon juice, salt and pepper. Refrigerate until ready to use (can be made one day ahead – store in refrigerator). For grilling salmon: season fillets with salt and pepper, and drizzle lightly with olive oil – spray grill pan with nonstick cooking spray, and heat over medium heat. Add fillets, skin-side up, and cook without moving for about 2 minutes. Flip salmon over, and cook for an additional 5 minutes (for thicker fillets, you can place the fish in the broiler for this step. Unless your grill pan is oven-safe, transfer them to a baking sheet before doing so). Skins can be removed, if desired. 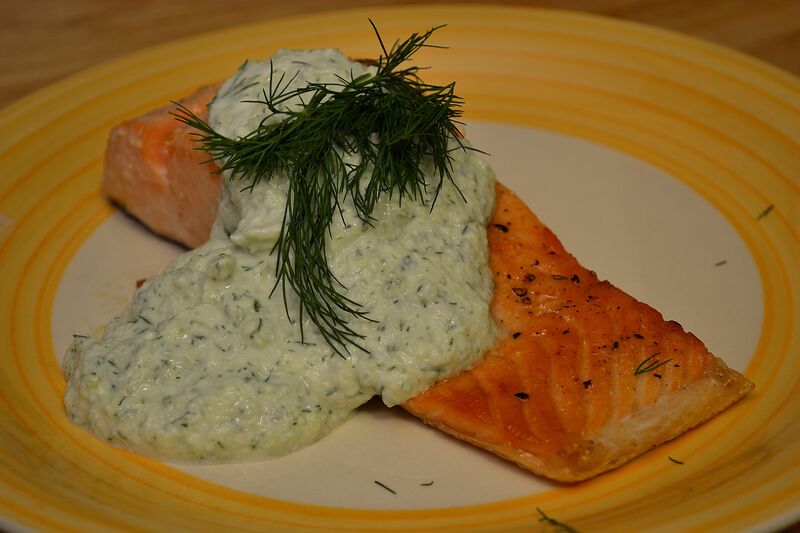 Top fillets with Tzatziki and garnish with dill; serve immediately.